Soil Requirement: Well drained preferred. Quite tolerant of a wide range of soils. 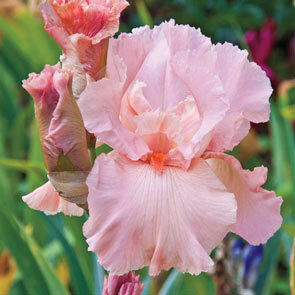 Beautiful, warm pink blooms open early AND late in the iris season. Its rich tones won't fade, and the salmon-pink beards further enhance each bloom. 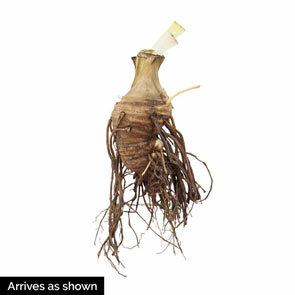 Flower Form Flowers are fan-shaped, with three drooping petals called falls and three upright petals called standards. Foliage Type Glaucous-green, sword-like fans of stiff upright leaves with some dying back in colder climates in winter. Planting Instructions Set rhizome so bottom half is below ground level. Firm well and water thoroughly. Plant where they will get at least 5 hours of sun per day. Soil Requirements Well drained preferred. Quite tolerant of a wide range of soils. Pruning Remove spent flower stems after blooming. In late fall; cut back foliage to 6" fans. Clean plant debris before winter to prevent borers overwintering.